This is a quick update on my post of last week on the rush for yield among private investors and what it meant in terms of interest rate disequilibrium. Following my post, Thomas Aubrey from Credit Capital Advisory kindly provided me with an update of his ‘Wicksellian differential’ chart. You can also find it here. 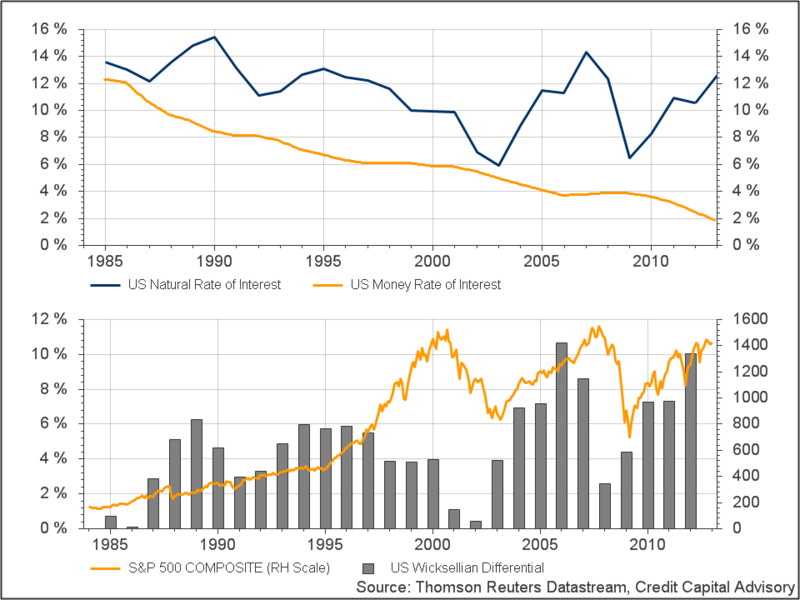 As you can see the differential between the estimated natural rate and the money rate of interest in the US have kept increasing and almost reached pre-crisis peak. According to his calculation, the potential differential now reaches………10%. It’s indeed huge. Try for a second to imagine the Fed all of a sudden increasing their target interest rate by 10%…… No you’re right, we just can’t imagine it. Frankly, I hope his calculation is wrong but…I wouldn’t bet my life on it. Consequently, Thomas Aubrey believes that it backs up my claim about malinvestments. Meanwhile, in a speech called ‘The economic consequences of low interest rates’ at the International Center for Monetary and Banking Studies on the 9 October, Benoit Coeuré, member of the Executive Board of the European Central Bank, misunderstood Wicksell and inflation, justifying very low interest rates. Not only Mr Coeuré seems to believe that CPI adequately reflects inflation, but also, according to him, inflation is always zero when the money rate of interest equals the natural rate. This is not true: real shocks can temporarily push inflation one way or another, but over the longer term productivity becomes the main driver behind inflation and deflation. In a world of productivity increases (and increasing output), deflation should be the norm (as it was the case at the end of the 19th century and early 20th). A zero level of inflation in this context would actually mean that there is hidden inflation. George Selgin has written a lot on this. See his Less than Zero book or this video. Last Friday, FT’s Henny Sender discussed the Fed’s impact on markets. According to a Hong Kong-based hedge fund “the Fed is always there. It is clear that it will not tolerate a decline in asset values. If you sell in the face of QE, you look like an idiot.” Sounds like the best way to completely distort markets. Free markets you said? Today, John Authers, in another FT piece, says that “Western economy is overcentralised, creating extra risk”. I obviously won’t disagree with him. He cites Nicholas Taleb (reminding me of Larry White). But one thing particularly struck me: Taleb seems to think that hedge funds “are developing strategies that aim to disintermediate the banks, such as loan funds.” This is very, very close to my own opinion, which I haven’t mentioned yet on this blog: technological developments will enable shadow banking to grow under one form or another to desintermediate credit creation. This is something big, and it will require many blog posts and possibly a research paper…and some time.